Calci-Lux is a high quality product water soluble. It is a dietary supplement that is given to the formation of eggshell good, good skeletal development in young birds during the breeding season to help prevent egg and also in cases of calcium deficiency. Calcium is an essential element in the bird body especially for the proper functioning of the nervous system. 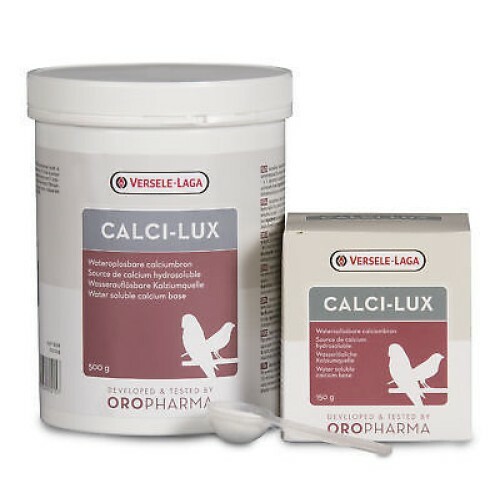 Calcium deficiencies in birds regularly result in serious health problems. If the bird has calcium deficiency can be accused calcification of the skeleton and bone deformation. Calcium deficiency to the birds during the rearing period results in poor eggshell formation and may contribute to egg breakage. • Promotes good egg shell formation. • To treat and prevent calcium deficiency in breeding and molting. Preventive: 1 level measure (4 g) twice a week for every 100 grams of food or per 250 ml of water. Before and during the breeding season: 2 level measures (8 g) daily per 100 g of food or drinking water per 250 ml. In the case of a calcium deficiency: 3 level measurements (12 g) per day per 100 grams of food or drinking water per 250 ml.